This article on marketing your self-published book is by far the longest in the series of making money with books, and for good reason. A successful book launch will get you ranked on Amazon but you need consistent monthly sales to maintain those rankings. A good marketing plan will get you the handful of sales you need to keep the Amazon ranking system working for you, and send you lots of sales from readers browsing and searching the platform. I use the three book marketing strategies below to generate 190 sales a month from Amazon Marketing Services and another 60 from my own and other websites. That 250 sales across ten books is enough to get me an average of 670 total copies sold each month. I sell over 400 copies of my books because that small amount of marketing helps me stay ranked within each book’s categories. Best of all, the three ways to market your books are almost completely passive. Once you set each up, they’ll consistently make book sales without any extra effort. 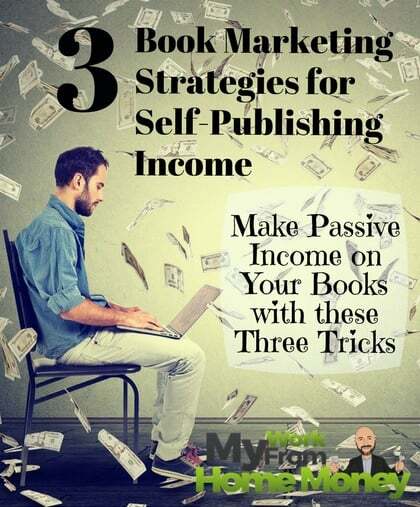 It makes self-publishing one of the most passive income streams I’ve ever seen. Your singular focus in marketing your book is to sell enough that it ranks well within its categories. That doesn’t mean selling dozens of books a day. If you can sell a few dozen copies of your books each month through your own marketing, that’s going to be enough to rank well in most categories. When you rank within the top 10 in a category, people are going to see your book while browsing or searching and you’ll have the opportunity to sell hundreds more through Amazon. That’s good news for us regular authors. If making sales were all on us, it would be tough driving the kind of traffic you need to make a living as a self-published author. Fortunately, Amazon gets hundreds of millions of visitors a month and wants them to buy your book. Still, even driving a few dozen sales a month from your own blog might be tough for most bloggers. That’s why you need a three-pronged strategy for getting those sales you need to help Amazon rank your book. The best part is that all three of these marketing strategies is almost completely passive once you set it up. Each will drive enough incremental sales to keep your book ranked in its categories and get Amazon to do the rest! 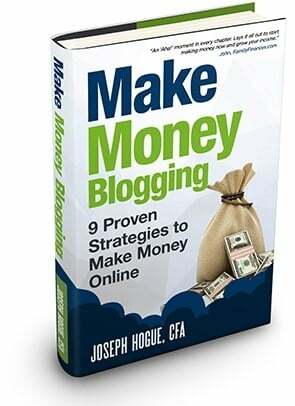 Marketing your book on your own blog is the easiest and first step you should take. Each year, create a ‘Best [Topic] Books to Read’ list with five to 15 books in a topic related to your niche. Get your Amazon affiliate link for each book when your linking to it in the post. Of course, your book should be one of those recommended. These are super-easy to rank and always make me a few bucks a month from Amazon every month as well as lead to a sale or two of my own books. If you followed my self-publishing blogger strategy then you’ve got five to ten posts that were turned into chapters in your book. By the time your book is published, these should be getting some Google search traffic each month. Go back in and update them with a couple of paragraphs in the intro, teasing your book and including a link. These are easy marketing targets because the people coming from Google search are laser-focused on the topic. You can also go back through other related posts on your blog and add a couple of paragraphs about your book. Make the description as related as possible to each post to appeal more directly to readers coming from Google search to that article. Include a text link plus a clickable image of your book. Always remember to use your Amazon affiliate code when linking to a book on your blog. You’ll get a commission on the sale plus your regular 70% for the book sale. Marketing your book through other blogs takes a little more work but will drive those extra sales you need each month. Guest posts are a good way to get a link back to your blog for SEO plus a link to your Amazon book page. Remember the golden rule in guest posting, what’s in it for the other blog’s readers? When reaching out to other bloggers for a guest post, be sure to pitch three topics that are related to their blog and to your book. Make the post about the reader, a problem they need to solve or an interesting story from which they can learn. Briefly and without being too salesy, talk about your book and how it relates to the post. 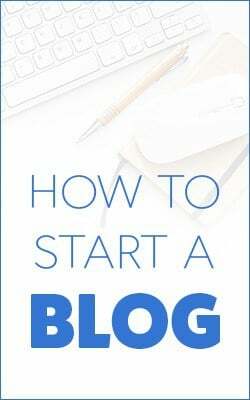 Link to your Amazon page but let the blogger know they are free to change it to their Amazon affiliate link so they will earn a commission on sales. Podcast interviews are another great way to market your book, especially if it’s a video podcast because people will be able to see your book. As with any kind of blogger outreach marketing, you have to develop a relationship with the other bloggers first. This means following them on social media, retweeting and sharing their content, and trying to build that connection. Put together a list of 25 – 50 podcasters within your topic. Browse through their shows and make sure they include guests. You’re not aiming for Dave Ramsey here, look for podcasters that are more likely to connect but that still have decent traffic per month. Many podcasters will provide their listener numbers in an advertising page on their blog so this can give you an idea of their reach. The sweet spot seems to be between 1,000 to 5,000 downloads per day for finding approachable podcasters. You might also target the New & Noteworthy list for easy interview targets. Once you’ve spent a little time developing a relationship with each podcaster, reach out by email and offer them a free copy of your book. Tell them you respect their opinion and would love their feedback on your work. If they like the book, it’s almost a slam dunk that they’ll ask you to be on the show to talk about it. Finally, you can also reach out for inclusion in book lists on other blogs. Do a Google search for ‘Best [Topic] Books to Read’ and copy down the URLs of the first 50 results. Go to each website to find contact information and email the blogger. Offer a unique paragraph describing your book that they can just copy/paste into their list along with their Amazon affiliate link. Marketing your book on Amazon Marketing Services is easily the most effective of the three strategies but also costs the most money. You’ll get a great return for your money though and will sell enough copies to keep your book ranked. The screenshot shows just a few of the ads I have running for my books. The ACoS column is Amazon’s estimate for Average Cost of Sales which is the amount you’ve spent on ads divided by the sales related to those ads. You can see that these ads are costing from about 3% to 20% of sales. Put another way, I’m making between 33- and five-times the amount I spend on ads through Amazon. Unfortunately, you can’t just throw more money at AMS. We’ll get to why that is later but first, let’s get to starting your own AMS ads for your book. There are two ads you can place for your book on AMS, sponsored products and product display. Both run on a pay-per-click basis meaning you only pay for advertising when someone clicks on your ad. Sponsored Product ads appear after the book description as ‘Sponsored products related to this item’ and at the bottom of search results. If you search for something on Amazon, you’ll see “Sponsored” at the top of these ads. Product Display ads show up on the right side of Amazon book pages. I’ll cover how to set up both types of advertising for your book but, to be honest, I see 99% of my sales from sponsored product ads. Product displays seem to work better for other types of products rather than books. They can help move the needle a little on your books but sponsored product ads work much better. The basics of Amazon book marketing are easy. You pick a type of ad and a book you want to promote. Then you pick keywords you want to target for your ad. When someone uses one of those keywords in a search or lands on a page of a related book, your book will show as a sponsored ad. You tell Amazon the maximum amount you want to spend a day on ads and how much you’re willing to spend for each time someone clicks on a keyword. Of course, you’re not the only one bidding on keywords so Amazon uses a bidding system to determine where you show up in the sponsored results. We’ll get into this in more detail in the next section. 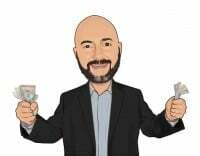 If someone clicks on your ad then you are charged a cost-per-click depending on Amazon’s bidding system and the amount you tell Amazon you are willing to pay per click. The amount you pay is very rarely as much as you bid so don’t worry about seeing runaway costs on ads. Amazon Marketing Services shows a complete picture of your ads, at the campaign and at the keyword level. At the campaign-level, you’ll see the following stats for each ad. Campaign Name – Be descriptive of your campaigns so you can tell them apart. You’ll have several campaigns for each book so it’s best to distinguish them so you can learn which strategies are working. Start and End Date – Your campaign will have a start date but I usually just let sponsored product ads run indefinitely. Product display ads will have an end date. Budget is the max amount you are willing to spend per day but I’ve never seen a campaign hit this max. Impressions is the number of times your ad is shown while clicks is the number of times someone clicks on your ad. aCPC is the average cost-per-click you’ve paid when someone clicks on your ad. Spend is the total amount you’ve spent on this campaign. Est Total Sales is the estimate for sales across all formats of your book including Kindle, paperback and audio. Note that this is total sales and not commission so this isn’t the amount you’ve received. You actually make about 70% on Kindle, 40% on paperback and audio sales. ACoS is the spend amount divided by the estimated total sales and is a measure of your advertising profitability. Any number below 100% is profitable, meaning you are spending less than the sales you’re making from the ad. Since AMS tracks total sales and not your actual commissions, this measure isn’t exact. To be more accurate, I would say an ACoS below 60% is a better measure of a profitable ad. Unlike other advertising platforms like Google Adwords where you want to pick only highly-relevant keywords, the secret to Amazon marketing is to use as many keywords as possible. You can have up to 1,000 keywords in each campaign and you’ll run several campaigns for each book. One of my best book campaigns has gotten 1.34 million impressions and made $2,219 in total sales, for a 22% ACoS. That’s only about 652 sales or a rate of 0.049% on impressions. That’s actually a good rate of sales so you see how you need to target thousands of keywords and get millions of impressions to sell as many books as possible. After creating your Amazon Marketing Services account, you’ll click on ‘New Campaign’ to start an ad. Then choose a sponsored product or product display ad. You’ll then select which book you want to advertise and will start creating your ad details. Campaign Name – Be descriptive here on the types of keywords or strategy you want to use. 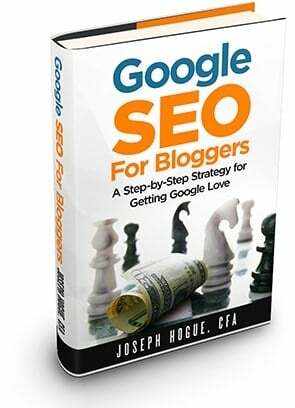 That way you’ll be able to see which strategies or keyword ideas are working best and can use them on other books. Average Daily Budget – I start with $15 a day but have never seen a campaign use the full amount. You’ll only be paying about $0.10 per click and most campaigns will get less than a few clicks a day. Duration – I always just let these run continuously to make my book marketing passive. Select ‘Manual Targeting’ to pick your keywords for the book. You can also run one campaign on ‘Automatic Targeting’ to see how it does. Add keywords you’d like to target for the ad. I usually run one campaign that just targets the Amazon suggested keywords and then several campaigns targeting keywords I select. Start with a bid of $0.25 for all keywords. Just like your daily budget, you will rarely (if ever) spend as much on a click as your bid. I average between $0.08 to $0.27 a click on dozens of campaigns and thousands of keywords even though I’m bidding $0.40 for many and as high as $1.00 per click for some. The reason you want to set your daily budget and keyword bid high is because it works into Amazon’s bidding system. Amazon’s bidding system factors in your budget, keyword bid and how relevant the book is to the keyword to estimate the potential for a sale. Remember, Amazon makes money off sales as well as the marketing costs. It wants to show books that will maximize its profit in both so it is going to rank your ad higher if you bid higher. Amazon only charges you when someone clicks on an ad and the cost-per-click is only as high as the next lower bid for that keyword. That’s why, while you might bid $0.25 for a keyword, you’ll only pay maybe $0.09 when someone clicks on your ad. The final piece of your ad is filling in the text you want to appear. This is very important for two reasons. Obviously, you want to make your ad attractive and enticing to get people to your book description so you can make the sale. You also want to screen readers by making your text as descriptive as possible. You only want people clicking on your ad that are going to be interested in your book’s topic. Make sure to include emotional triggers in your ad and the transformational idea readers are looking for in the topic. Create a sense of urgency with time-related words like today, now or fast. After you’ve perfected your text, click ‘Launch Campaign’ and your ad will be reviewed for publication. Most ads are approved and start running within a day. In my experience, the biggest problem with ad denials is in the text and Amazon will tell you why it denies an ad. Finding keywords for marketing your book is where you’ll spend most of your time when creating ads. You need at least a few hundred keywords for each campaign and should run at least four or five campaigns for each book. You won’t necessarily keep all these keywords or campaigns running forever but you want to start out testing as large a list as possible. 1) If you have blog articles related to the topic or chapters you published, you can use Google Search Console to download a list of search terms for which the articles are ranking. Go to your blog on Search Console, click ‘Search Analytics’ and then toggle ‘Pages’ to find the article and download all the queries into a list. 2) Don’t just stop at your blog articles. Use Ahrefs to find the search keywords for articles on other websites related to your book’s topic. Search Google for a few of your most relevant keywords and copy the URL address for the top five results. Go to Ahrefs and paste each URL into the Site Explorer search. Click on ‘Organic Keywords’ and filter for 0-20 in Position, export the results in a list. 3) Create another keyword list using titles of books from the Amazon Best Sellers list in your categories. Click through to each sub-category and copy the titles of the top 30 books as well as the most popular authors’ names. People are going to be directly searching for these books so you might as well ride along on their popularity. 4) You can also use Google Adwords to find keyword suggestions. Start an Adwords campaign on an article that is highly-related to your book topic. This doesn’t have to be an article of yours, any that is relevant to your book. You’ll copy the URL of the article into the campaign and Google will give you keyword suggestions for your Adwords campaign. You don’t actually have to start the campaign, just copy these keywords into a list for your Amazon campaigns. 5) Click through to each of the highest ranked books in your categories and copy the titles of the ‘Customers also bought’ books and the sponsored books. Some of these will be repeats of the titles you copied from your best-seller list so remove any duplicates. 6) You’ll also brainstorm a list of your most relevant keywords. Type these words into Amazon and Google to get more suggestions from the drop-down search. Searching for your keywords on Google will also give you a few more ideas from the ‘People also ask’ section and the ‘People also searched for’ section at the bottom of the page. 7) Use a keyword density checker online on your book’s text to find the phrases most often used in your book. These are going to be highly-relevant keywords since you’re using them naturally in the text. These seven steps should give you thousands of keyword ideas for your book campaigns. You’ll want to create multiple campaigns so you can keep keyword strategies separate and see which perform best. Starting a product display ad is very similar to the sponsored product ad process for your book. Click on ‘New Campaign’, select Product Display and which book you’d like to advertise. You can target your ad by product, showing your book to people looking at similar books, or by interest where you book will be shown on Kindle E-readers and within categories on Amazon. Run a campaign in each of these to see how each does. You can always stop an unprofitable campaign and you really want to test all your options. Within the ‘by product’ option, you can target specific books or related categories. 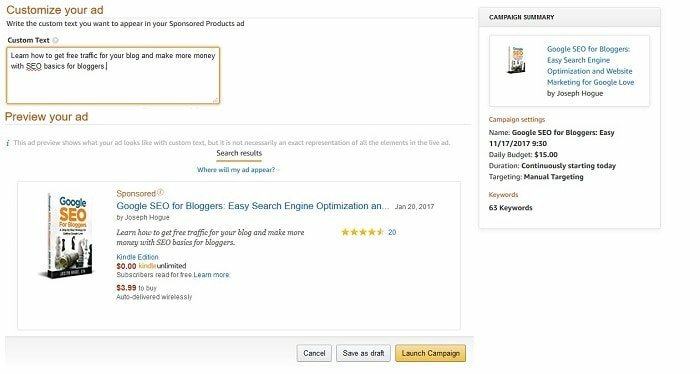 Targeting specific products, you’ll be able to enter keywords and product names and Amazon will generate a list of potential products on which to show your ad. This is where you want to get creative with your targeting. Within the ‘by interest’ option, you’ll select categories on which to advertise your book. You don’t necessarily need to select only the categories most related to your book’s topic. Think about your own reading habits, you don’t just read books within one topic. You’ll then place a bid for your cost-per-click and the campaign budget. Notice this isn’t a daily budget but one for your entire campaign. The minimum here is $100 and a good place to start with your campaigns. You will also need a start and end date for product display ads. The default is usually two months and I usually leave it as that. I also usually choose to ‘Run campaign as quickly as possible’ in the Pacing option rather than ‘Spread campaign evenly over its duration’. This will promote your book as heavily as possible, which is what you want to really boost ranking. Finally, you’ll customize your ad text just like you did with sponsored product ads. In product display ads, you’ll also get the chance to add a headline. Search for some of your keywords on Google and note the most interesting titles in the results for potential headlines. Amazon will show you how your ad will look on Kindle as well as the three other size of ads for Product Display and where they will appear. If you like how your ad looks, click to submit your campaign. It will take a few days for impressions of your ads to start showing in your campaign and maybe weeks to start really seeing any clicks and sales. The click-through and conversion rate on Amazon ads is horrendously low. Even on good ads, only about 0.2% of your impressions will get clicked and only 10% to 20% of those clicks will lead to a sale. That’s ok though because you’ll be getting millions of impressions across all your campaigns and will make enough sales to keep your book ranked in its categories. Keeping your category rankings is all that matters because that means you’ll make lots of sales from people browsing and searching on Amazon. After about a month, you can go into a campaign to fine-tune your bidding and keywords. 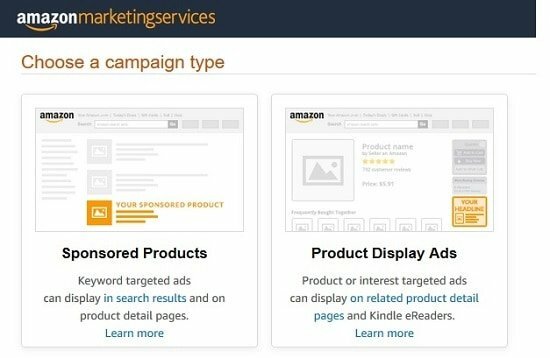 Click on the campaign name in Amazon Marketing Services and you’ll be taken to your keywords and general campaign settings. You’ll be able to see each keyword and all its detail for your campaign. I’ve deleted the actual keywords from the screenshot here. You can see that I’ve increased my bid a lot for these profitable keywords. Test increasing your CPC bid in increments of $0.10 until the ACoS reaches around 40% to get the most impressions and sales possible. You can also decrease or delete keywords that are not profitable, i.e. an ACoS of 80% or higher. I would usually keep a keyword or campaign running even if the ACoS is as high as 100%. You may be losing a little bit on the ad but the sales you get here will mean a higher ranking and more organic sales on your book. Most of your sales through marketing will happen through your Amazon Marketing ads. That means testing a massive list of keywords in multiple campaigns per book to see what works. It’s not unusual for me to develop a dozen ad campaigns for a book, each with hundreds of keywords. Let your campaigns run for a couple of months and then revise them once a month for the next three months. Increase your bid on highly-profitable keywords and decrease or delete highly-unprofitable keywords. The great thing about pay-per-click campaigns is that you only pay when someone clicks on your ad. If your cover image, title and description tell potential readers exactly what they can expect then they’re only likely to click on your ad if they are interested in buying. That means you can advertise on a huge range of keywords, even in seemingly unrelated books and topics, and still get a good average cost-per-sale. Don’t forget that you also want to have all three formats of your book available while you’re running ads. At the minimum, you should have a Kindle and paperback version available, but I would create an audio version as well. If you’re going to pay when someone clicks through to your book’s page, you want to give them every opportunity possible to buy. Marketing your book is one of the biggest factors in making consistent sales every month. You don’t have to be an expert marketer. You just need to drive a few sales through marketing to keep Amazon’s ranking program working for you. A good book marketing program is almost completely automated and will mean passive income self-publishing for all your books.